We’re in the peak of summer and it’s hot, hot, hot. As much as I love being outside and soaking up some sun and heat, cooling down is always nice, too. And enjoying some delicious ice cream is one of my favorite ways to do that. I’m a huge creature of habit, in that I have my three or four favorite flavors of ice cream and rotate among those, no matter where I get it. Cookie dough and cake batter always speak to me. But if there’s a flavor available that just sounds too delicious or interesting to pass up, you bet I’ll try it. I’m trying to broaden my horizons, after all. Fun fact: I worked in an ice cream shop for five years. And I still love ice cream. This Sunday, July 17th, is National Ice Cream Day. I’ll take just about anything as a reason to eat some of this delicious sweet treat. Fortunately, Chattanooga has plenty of great places to make that happen. 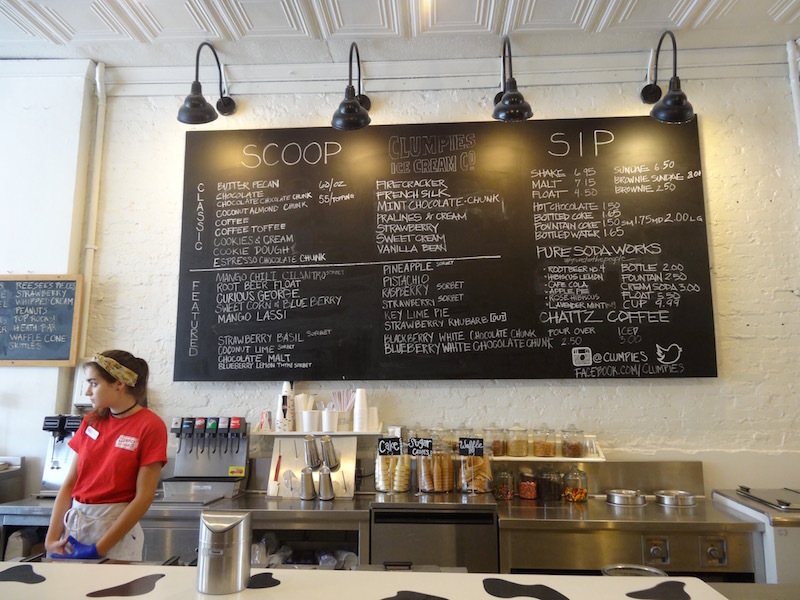 Here are 5 top spots for delicious ice cream in Chattanooga! You might want to visit each of these after reading this. Just so you know. This place is so unique! At The Ice Cream Show, guests can pick chocolate or vanilla ice cream as the base, and add in any number of mix-ins to create your own flavor. Then it’s all blended up and served soft-serve style, in a cup or your favorite cone. My usual combo is vanilla with cake batter and cookie dough pieces. You can create your own mix, or follow one of their recommended combinations, like vanilla ice cream with fruit and cheesecake pieces. 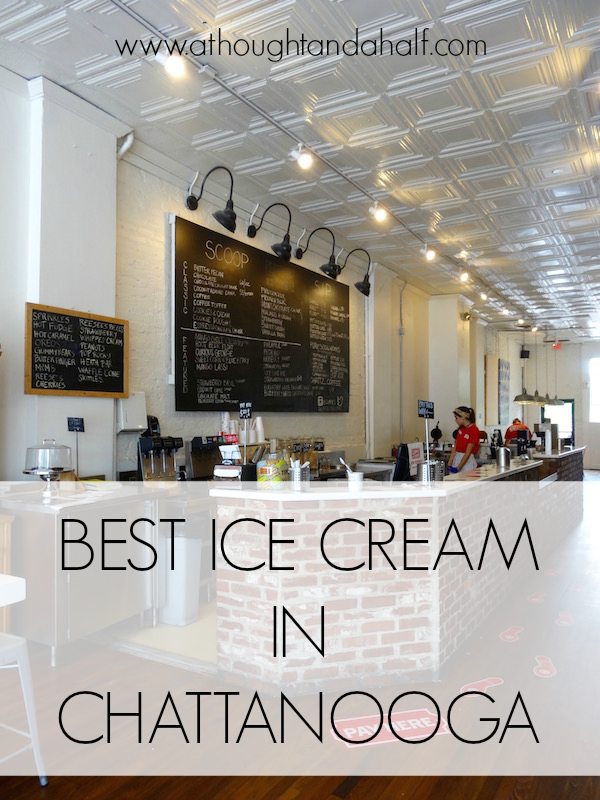 One of the most popular ice cream spots in Chattanooga, and recently ranked as the best ice cream in Tennessee by Buzzfeed! All of Clumpies‘ ice cream and sorbet flavors are handcrafted and have been since the operation started in 1999. In addition to their regular collection of delectable flavors (sweet cream, French silk, cookie dough, cookies & cream, mint chocolate chunk, espresso chocolate chunk and more), Clumpies also has rotating seasonal ice creams and sorbets. One of my favorite seasonal flavors is the Chattanooga Whiskey & Pretzel Crunch; it’s the perfect balance of sweet and salty. They announce their seasonal and special flavors on their Instagram and Twitter, so follow along so you don’t miss out! Clumpies also has a location on St. Elmo Avenue near Lookout Mountain and the Incline Railway. 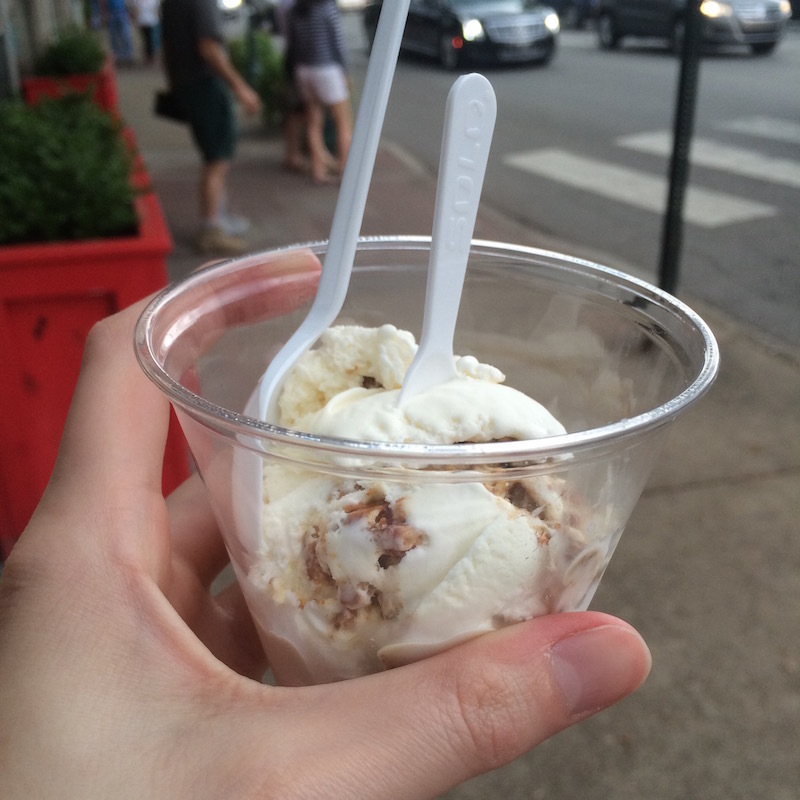 Chatt Whiskey + Pretzel Crunch ice cream… yum! A Chattanooga original and favorite! Milk & Honey is part of a five-restaurant group that include Taco Mamacita, Community Pie, Urban Stack and now Clyde’s. All gelato is made from scratch daily with fresh, organic ingredients, right in the heart of Chattanooga. Flavors range from the classic Milk & Honey, Chocolate, Strawberry, Coffee, to Birthday Cake, to Avocado and Pistachio, and beyond. In addition to gelato, Milk & Honey serves paletas (gourmet popsicles made from fresh fruit and juices), assorted baked goods and snacks, coffee and espresso and breakfast and lunch. Go to the Chattanooga Market on a Sunday and you’ll see owner Hannah Kleban with her bright teal cart. That’s right, Cookie Cow is not a traditional brick & mortar shop – it’s a traveling ice cream cart! Cookie Cow’s specialty is ice cream sandwiches, made with fresh-baked chocolate chip cookies and jam-packed with premium ice cream. 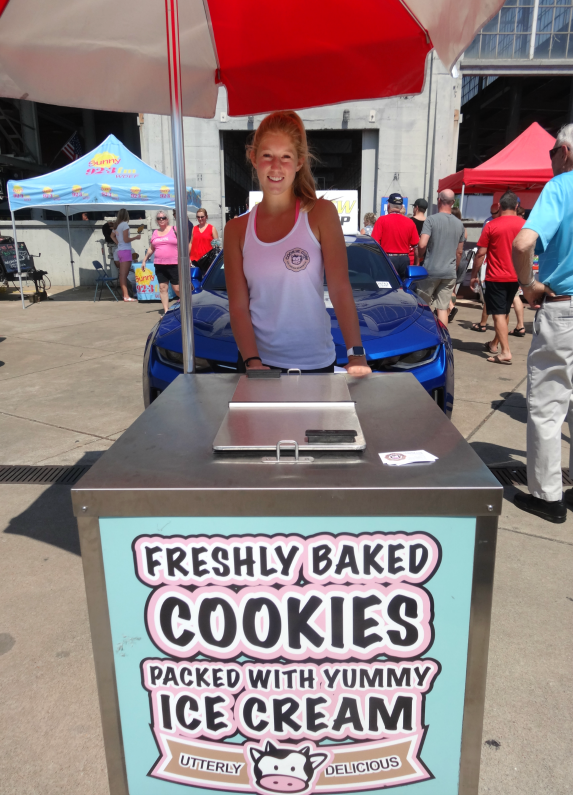 Hannah has “traditional” flavors like vanilla, chocolate and mint chocolate chip, and also rotates seasonal flavors as they’re available. Look for her at the market and any number of other events around town! She also does catering. Owner Hannah with her Cookie Cow cart! This little shop just opened in the last couple of weeks and it’s already getting some great traffic! 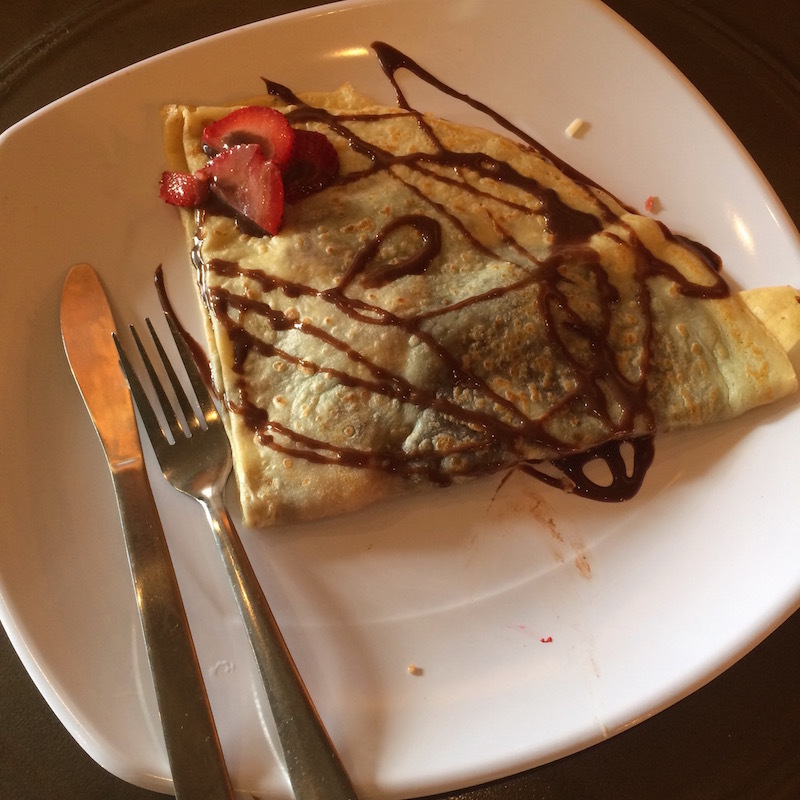 Adelle’s is a business borne from the mind of a local 12-year-old girl (named Adelle, of course) who wanted to share her love of crepes with Chattanooga. Adelle’s serves sweet and savory crepes and ice cream, all made from fresh, wholesome, hormone- and antibiotic-free ingredients. My strawberry Nutella crepe was indeed wonderful. Maybe next time I’ll try it with a scoop of cinnamon brown sugar ice cream. Ice cream is a delicious sweet treat, especially on hot summer days. Visit any of these places around Chattanooga to get your ice cream fix. You won’t be disappointed! 11 Things to Do This Fall in Chattanooga + a Giveaway!